Known for its intelligence, the Northern Mockingbird is a truly astonishing and handsome songbird. 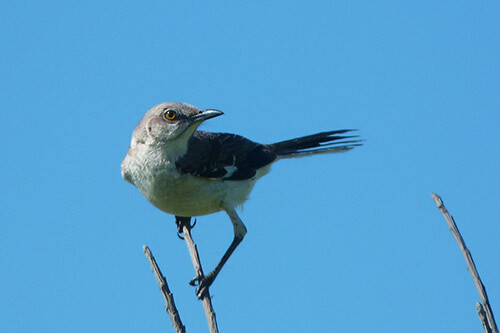 The Northern Mockingbird (Mimus polyglottos) is the only species of mockingbird commonly found in the country. 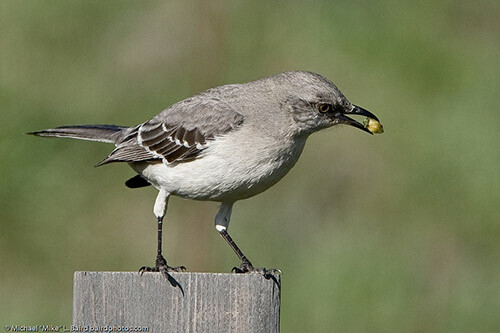 American Expedition is proud to present Information About Mockingbirds, Interesting Northern Mockingbird Facts, Northern Mockingbird Habitat Information, and Photos of The Northern Mockingbird. 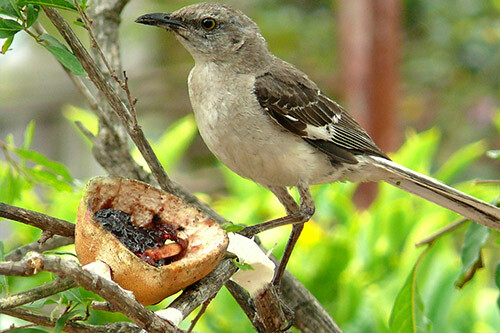 A Northern Mockingbird is a medium-sized bird that is gray in color with black and white wing feathers. Its underside is white, the bill is black, and its iris is yellowish-orange. A typical mockingbird measures between 8-11 inches long and weighs 1.4-2 ounces. Males are a bit bigger than females, but other than that they look the same. Mockingbirds breed in the spring and early summer. The males arrive first and claim territory. When the females arrive, the males show off their territory and wings by flying around and singing. Both the male and the female build the nest in the trees or shrubs and then the female lays between 2-6 eggs. The eggs are greenish in color and splotched with reddish brown spots. The female incubates the eggs for approximately 2 weeks, and when they hatch, both the male and female bird will assist in feeding them. After about 10 days, the chicks are independent. After one year, they reach sexual maturity. The lifespan of a mockingbird in the wild is 8 years. Female mockingbirds do not sing as much as the males do, and they are much quieter as well. Mockingbirds can live up to 20 years in captivity. Mockingbirds are known for their singing abilities. A male mockingbird can learn up to 200 different songs. A mockingbird sings all throughout the day and into the night. A male sings different songs in the fall than in the spring. Mockingbirds usually hang out alone or in pairs. Mockingbirds are monogamous, which means the pair will stay with each other for life. A pair of mockingbirds will have 2-3 broods per year. 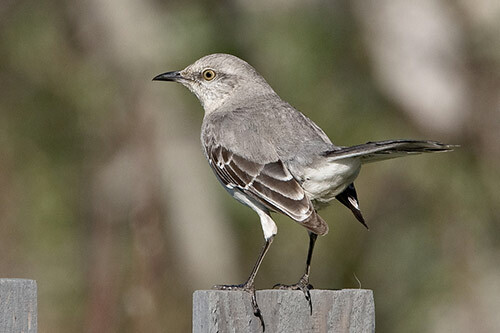 Northern mockingbirds tend to imitate other birds and sounds they hear. This bird is very territorial and will not hesitate to attack intruders. 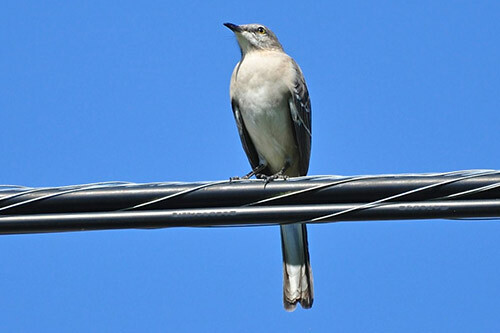 Mockingbirds are located all throughout the United States and Mexico and parts of Canada. They reside in fields, forest edges, and backyards. They sit high in trees, on fence posts, and on utility lines and sing loudly. They also hop along on the ground looking for food. Mockingbirds are omnivorous. In the summer, their diet consists mainly of insects. During the fall and the winter, they eat more fruit and berries than insects.